The World Wide Web became commercially viable 20 years ago, and it quickly became clear that the phrase “The Internet Changes Everything,” was spot on. The Internet has forever changed and continues to transform the ways we do things, both in the business world and in our personal lives. It has spawned and enabled an explosion of innovation, from cloud and mobile solutions to social networking to big data and analytics, destroyed old business models and created new ones. Most recently, the Internet has delivered its latest game changer: the Internet of things, or IoT. As with the Internet innovations that preceded it, IoT again presents tremendous potential for disruption–along with all of the opportunities and challenges that go along with this type of sea change. 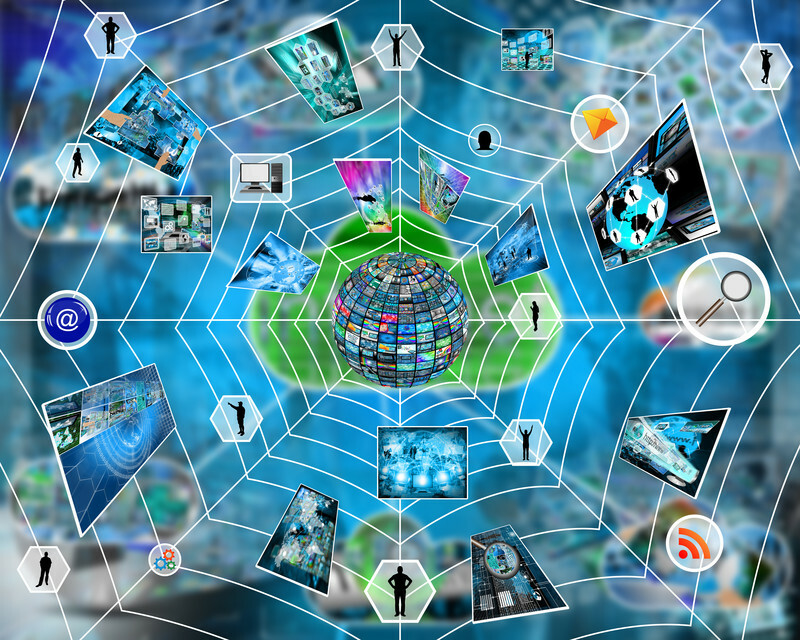 Gartner forecasts that by the end of 2015, there will be almost 5 billion ‘things’ connected to the Internet. By the end of 2020 that number will rise to 25 billion, or more than three things connected to the Internet for each person on the planet. 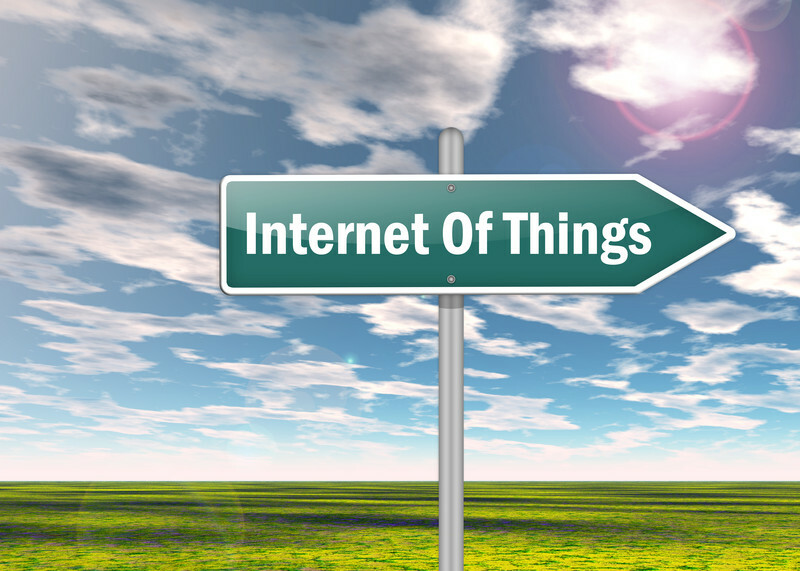 Yet IoT is barely on the radar of most small and medium business (SMB) decision-makers. 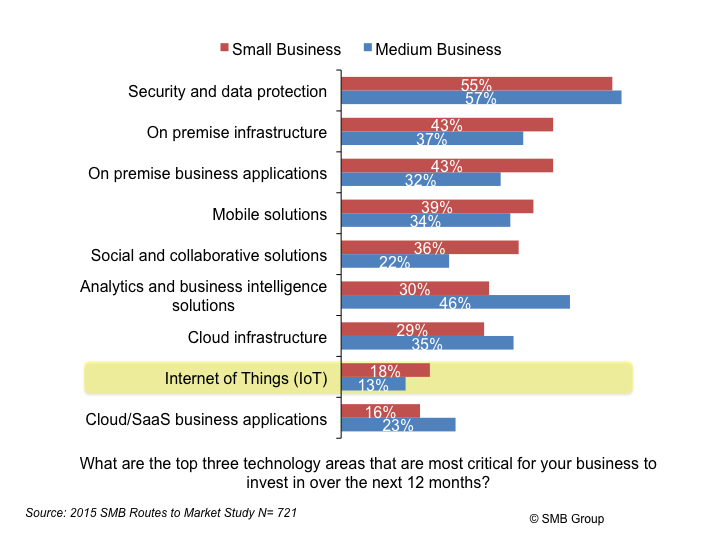 When asked in SMB Group’s 2015 SMB Routes to Market Study, “What are the top three technology areas that are most critical for your business to invest in over the next 12 months?” IoT ranked at or near the bottom. Only 18% of small and 13% of medium business decision-makers selected IOT as one of their top three priorities. Clearly, SMBs need help to better understand this trend, and the opportunities and challenges it presents. Cyber-Physical Systems or “smart” systems are co-engineered interacting networks of physical and computational components. These systems will provide the foundation of our critical infrastructure, form the basis of emerging and future smart services, and improve our quality of life in many areas. Cyber-physical systems will bring advances in personalized health care, emergency response, traffic flow management, and electric power generation and delivery, as well as in many other areas now just being envisioned. Planes with internet-connected parts can send data to predict maintenance requirements and improve flight and fuel efficiency. Tennis players can track and analyze ball speed, spin, and impact location to improve their game via sensors in their racquets. Smart buildings can monitor energy use in real-time, so they can use heating and cooling resources more effectively, and run elevators based on actual occupancy. Manufacturers can operate more efficiently by enabling equipment to proactively call for maintenance before a failure occurs. While wearable, consumer IoT devices have garnered much of the early buzz, most experts agree that business and public sector opportunities will dwarf those on the consumer side. But, commercial IoT systems have the capacity to ingest vast quantitative of data from different sources. All of this data must be normalized and secured, and then analyzed to make sense of it. These are the hard bits, and most SMBs need help to understand these variables to effectively harness the power of IoT. Dell World 2015 provided a glimpse into its approach to create an IoT solution that does much of the heavy lifting with the Dell Edge Gateway 5000 Series. Dell’s Gateway collects, manages, and secures sensor data, using Edge analytics for analysis and to mitigate potential data overload issues. The solution determines what data is important, and transmits that to the cloud for analysis and action, leaving unnecessary data on the local device. Several Dell customers demonstrated how they use the solution. For example, RCR Racing uses Dell’s Gateway solution in its “Smart Pitstop.” Racing at speeds of 190 mph or more, successful pit stops are essential for RCR car performance. In fact, auto races can be won and lost because of the many actions–from wheel changing to refueling–that the pit crew performs in a matter of seconds. In addition to monitoring performance indicators in its Smart Pitstop dashboard, RCR assesses pit crew performance. By monitoring key variables, such as how the heart rate of a tire changer affects how well they secure the tire, RCR improves performance and increase confidence. Looking ahead, RCR plans to add more sensor information, such as weather and track data into the dashboard to further improve outcomes. Dell is also working with third-party software vendors and system integrators for domain expertise. At DellWorld, Eigen Innovations demonstrated how it uses Dell’s Gateway in its Intellexon Gateway in factory floor environments to collect boiler room data with thermal imaging cameras. The cameras monitor the melting process, and proactively alert for certain conditions so that very expensive equipment can be fixed before it goes down. Eigen builds human expertise into the system, training it to crunch relevant data in the cloud and analyze it for continuous monitoring. In addition to providing data filtering, Dell’s Gateway normalizes data from different sensors–even data from older, non-Internet compliant sensors–into a unified state for analysis. Combined with included security and manageability capabilities, Dell’s Gateway offers a holistic IoT approach. With limitless potential use cases, and early adopters already experiencing great outcomes, IoT could be the biggest Internet-fueled game-changer yet. But along with boundless opportunity come questions and challenges, especially for SMBs, who typically lack IT resources and expertise. Where do I start? What projects are realistic for my business? How do I store, secure and analyze it? These are just some of the questions to consider. Pick a small, realistic test project, using devices you already have for sensors. Some companies have even used old smartphones to get started. Address a clearly defined business problem or opportunity with an affordable solution. Identify goals and metrics–such as lower fuel consumption, proactive alerts, or more efficient operations–so you can measure effectiveness. Look for pre-configured solutions specific to your use case/industry so that you don’t have to figure out how to pull all the pieces–security, analytics, storage and management–together. Seek help from vendors and partners that can help reduce IoT complexity and risk and help you gain benefits more quickly. Finally, keep in mind that most big businesses have big plans to instrument their operations for IoT to reap the intelligence and performance gains that IoT offers. SMBs need to get on the IoT learning curve to gain these same advantages and compete on a level playing field. P.S. Dell is sponsoring an Internet of Things Contest! Design your IoT solution with real business impact for a chance to win one of 16 prizes worth up to $150,000 in value.